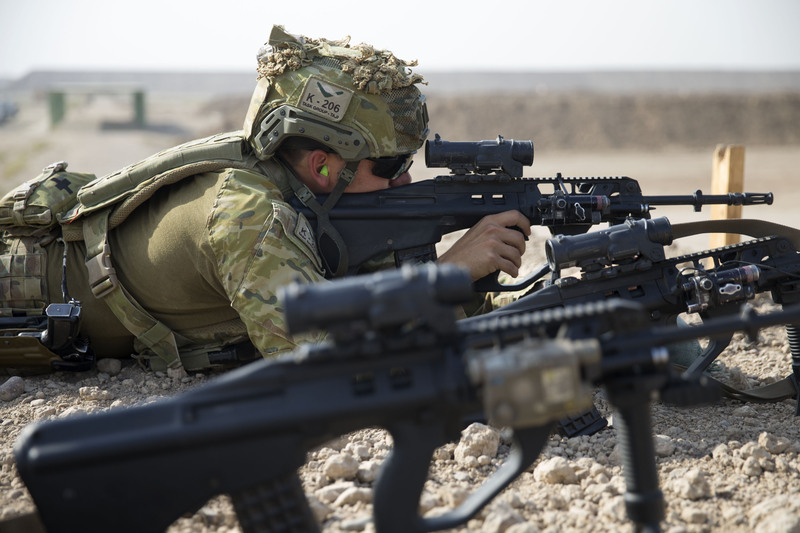 The latest version of the Army’s Steyr rifle has finished its first full operational deployment, with the Army reporting soldiers with the training team in Iraq were happy with the latest variant of what is now a near three-decade-old weapon system. Soldiers with Task Group Taji 5 troops, deployed to Iraq as part of Operation Okra, found the Enhanced F88 (EF88) Steyr worked fine in the extreme heat and the dusty conditions of Iraq without problems. The EF88 is made by defence company Thales at Lithgow and is a development of the original F88, an Australian-built version of the Austrian Steyr AUG. This was adopted in 1988 to replace the Army’s L1A1 self-loading rifles and were progressively issued across the Australian Defence Force. However, special forces continue to carry the US M4 and there is considerable debate across the defence force about which is better. Rather than the fixed optical sight of the original F88, the EF88 features rails for different optical and aiming devices and can also mount a grenade launcher. Major Timothy Soper, who commands the Task Group Taji Logistics Company, as saying EF88 superior accuracy, robustness and weight identified during testing and trials had been confirmed in its first full operational deployment. “The tiered design approach applied to the EF88 has resulted in a common system capable of being tailored to land combatant role and task,” MAJ Soper said. The EF88 entered service in the middle of last year for selected units but Task Group Taji 5 was the first to deploy with the new rifle. Task Group Taji 5 commander Colonel Steve D’arcy said the EF88 was very popular with personnel and had proven itself as an extremely versatile weapons system. “Our personnel carry the EF88 as their primary weapon system on a day-to-day basis,” COL D'arcy said.